Last month, I had the pleasure of meeting Pavithra, (from Eat, Live, Burp) when she came to Bangalore as part of her holiday travels in India. Pavithra is the first blogger I have met in-person, and frankly the 90-odd minutes we spent chatting away at the Food Court in Mantri Mall seemed too short! I’ve been following her blog for a while now, and I really love her simple, effective style and innovative combinations. Do check it out. Pavithra totally made day by being so easy to get along with and by bringing me a little goodie bag of food-related gifts from Seattle! In the bag was a packet of Cinnamon-Ginger-Molasses granola, a bottle of peppermint extract, sachets for great coffee from Starbucks, a Starbucks reusable to-go coffee mug, and a set of Christmas themed mini-muffin liners! And that folks, is what you see below. So what’s in the mini muffin liners? 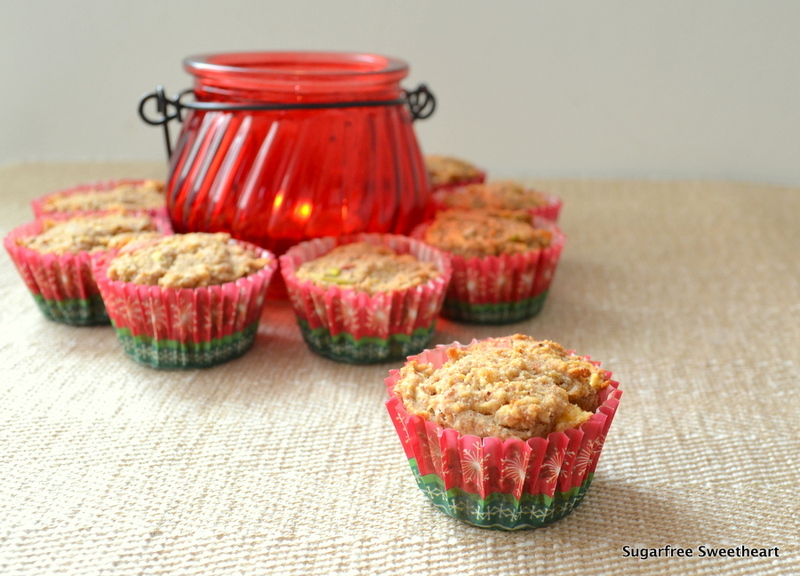 Apple-cinnamon gluten-free, egg-free mini muffins! And, why no recipe? While these muffins looked adorable, and made the house smell amazing, the taste was just short of must-share-fantastic. I made these with almond flour, oats, brown rice flour, millet flour, flax seed and apple, with cinnamon and vanilla for flavour. I used milk and olive oil to moisten and Levulose (a low GI sweetener) to sweeten. The muffins were very slightly bitter (maybe the flax or Levulose) and they didn’t puff up much either. I’ll give apple cinnamon muffins another go someday – maybe without the millet which may have been too heavy for the flax seed to leaven properly. Until then, let’s talk about 2014. After the hectic heap of Diabetic Awareness posts in November, I’ve decided to take it slow in December to figure out what I want to do with Sugarfree Sweetheart in 2014. Building an illustration library of my most common used illustrations so that once I’m done it will be much faster for me to put together an illustration and post a recipe. Collecting enough recipes for an illustrated cookbook, maybe for novices, and of course, all diabetic-friendly. Working on charts, brochures, and pamphlets on Diabetes Awareness and the Diabetic Diet that I can distribute at hospitals or even schools. What would you like to see at Sugarfree Sweetheart in 2014? I think your illustrations are lovely. I like your ideas. Especially creating resources you can distribute to others. Very cool! I would love to see some short videos. Don’t make them too long ( 3mins max). It’s always great to meet a fellow blogger and even greater when you hit it off. How wonderful that she brought little presents as well. Thanks for sharing and omg 2014 really is here! They look so nice Priya ! Meeting fellow bloggers is fun. Love the illustrated cook book idea. Maybe a segment for the kids with diabetes would be great too. Or trying region based cuisines too focused on Diabetics. The flyers are a great idea for awareness. Maybe you could use the summer vacations as a good time to get it through some children ( maybe summer camps ). The kids will love the illustrations.Good luck for all the plans ! Thanks so much for all the suggestions Kumu! Now I really have NO excuses not to get stuff done in the new year! So many great ideas to choose from! 🙂 Wishing you and your family happy holidays and an amazing new year! Thanks Shruti! I hope I can make it better next time! Thanks for your comment, Celeste! Blogging is unexpectedly fun! 🙂 And the book, well let’s see.. if I can get some interest for it then I would definitely like to get it published! Live videos, eh? Ha ha! I’m not that great in front of the camera but just for you, I’m going to do one video at least next year – just to try it out and do new things! Thanks for the idea, Violet! 🙂 And happy holidays to you too! Yay! I’m looking forward to your video next year! 🙂 Thanks for listening. hehe Merry Christmas!!!! it was so much fun meeting you as well..i wish i had spent more time in Bangalore. i am so glad you are already using the liners..cant wait to see your recipe. How fun! Those cup cake liners are so cute..will look forward to your improved recipe. I guess your idea of making pamphlets and flyers and distributing them in local centers is a great idea. Hi Priya, your plans for 2014 sound really lovely! It’s a nice idea to take it easy in Decemeber, there’s so much going on around the holidays. It makes room for thinking about the new year. Another idea for you is researching Diabetic blogs/sites and doing guest posts and vice versa. It will just bring more exposure to the disease.